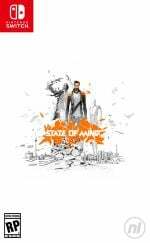 Daedalic Entertainment has announced that its upcoming 'futuristic thriller' State of Mind will launch on Nintendo Switch - and other platforms - on 15th August. The game delves into the technological promise of the world we live in by jumping forward to Berlin in 2048. You'll be taking on the role of Richard Nolan, a journalist whose wife and child are missing, is losing all of his memories, and whose life is starting to fall apart. The world is on the brink with a lack of resources, polluted air and water, crime on the rise, and rampant wars, and it’s all down to Richard to find out what’s going on. The game features a low-poly art style that aims to represent the fragmented nature of Richard’s world, allows you to play with several playable characters, and is said to feature around 15 hours of gameplay. Console versions of the game are expected to launch at €39.99 / $39.99 / £34.99. Yeah, when a game is announced to come out in a month, and the new trailer still doesn't have gameplay footage (unless it has, and we just don't understand how it's played at all?) then you know they won't be trying to wow you with riveting action. Alriiight, 3rd person adventure alá David Cage. Seems very much up Daedalic's alley. The animation is a little rough, but overall the aesthetic is tight. @smyr Seeing that footage, and how it actually looks like a decent third-person adventure game, makes the decision to omit gameplay from the trailer even more puzzling. We’ll see how the reviews treat it. If I were to get this, it’ll be on Switch. However, I already have Okami pre-purchased for Aug 9th and that’s like a 30 hr game, so we’ll see if I even have time for this. This seemed awesome... until saw the price. Was expecting 20 quid mark. Not a bad thing to have in the eShop. Would be nice if the article better describes how you play this game. Looks good. Will wait for a review but could be promising. Who are the people who 'play' all those weird cutscene games without any gameplay? They must be the same people who don't press start during the logos of the game developers when you boot up a game. @Sakura7 My thoughts exactly. Ive got so many other games I want to play all $30 or less that this can wait. Not devaluing his game by any means but there's no shortage of games on the Switch. Theme is intriguing. I love games with a good story, but only if the game mechanic itself is really good. Perhaps this should be a movie in stead of a game? ... and then Yooka Laylee is also coming out physical in August and will only be available in small quantities, but I want to play State of Mind more... but my finances are already tight as it is. I will definitely get this, but I hope I can still find physical copies a month or two after release. EDIT: And there's Psyvariar Delta that's coming out physical in Japan also at the end of August. Too many games I tell ya! I really like the animations, graphics, art style and overall design theme I hope this turned out as good as it looks to be. I was hoping for a longer campaign though, 15 hours really .